Hiking, Backpacking and Wild Camping Blog: Peak Park To Revise 4x4 Strategy. Peak Park To Revise 4x4 Strategy. Peak Park Authority reviewing its policy on 4x4s and trail bikes using unsurfaced roads in the Park. 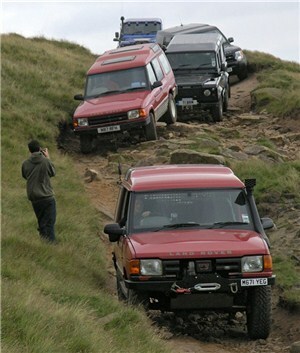 The Peak District National Park Authority has announced that it will update its strategy on managing 4x4 and trail bike use on unsurfaced tracks to help prevent routes being damaged. At a recent Park Authority committee meeting, the decision was taken to reconsider park policy following concern from local residents and interest groups about 'impact being caused by 4x4s and trail bikes on the tranquillity of the national park and on the condition of unsurfaced routes'. The end result is that the members of the relevant committee will work with officers to prepare a revised strategy and policy which will be considered by the full authority on 2 December, 2011. In the mean time, there will be meetings with senior police officers and councillors from highways authorities covering the National Park 'and see if more can be done' it says here. There's also going to be a new consultative group involving organisations, user groups and interest groups which will meet in early September and look at practical measures which could be implemented. The decision is likely to be hailed as a small victory by the charity Friends of the Peak District which held a rally at Stanage Pole a week ago calling for the Park Authority to 'get tough on off-roading'. The group, in essence, wants the Peak Park Authority to ban off-roading in sensitive areas completely rather than managing damage. Use of lanes which are currently classified as roads, including Long Causeway, by recreational motor vehicles is legal at present – the Peak Park Authority has identified 24 tracks – out of 180 non-classified highways – as 'priority routes where action was needed' and has banned traffic from one of those routes using a Traffic Regulation Order with public consultations on three other Orders. In addition, the authority has taken steps to carry out improvements at a wide range of sites – more about them at www.peakdistrict.gov.uk/vehicles. It's an interesting dilemma. Despite the views of many other Peak District users who'd happily see all off-roaders banned, they do have a legal right to use unsurfaced highways and preventing them from doing so, isn't an easy process. That may frustrate the anti off-roading lobby, but then we live in a country where legal rights are generally protected. In other words, even if you not unreasonably detest off-road recreational vehicles, you need to be aware of the benefits of our legal system as well as the downsides. More about the Friends of the Peak 'Take Back The Tracks' campaign at www.friendsofthepeak.org.uk/Campaigns/Take_back_the_tracks. I think they should just set aside a couple of square miles for anyone/anything to use. If it gets a little bit wrecked then so be it, but have zero tolerance everywhere else on the mountain. plenty of footpaths, bridleways and now RUPPs that can be walked on, leave the roads to the vehicles. And yes i am a Peak District resident.